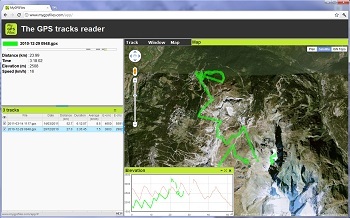 A web app to read GPS tracks stored on your PC Windows, PC Linux or Mac. 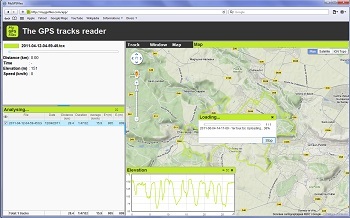 It is also possible to quickly create and modify GPS tracks. Easy: You can open tracks by two ways: by the menu "Tracks->Open..." or by dragging files into the web page*. No registration is required. Quick: Tracks files are directly read* and processed from your computer. No need to upload them to a server*. Multi-tracks: You can open and display several tracks at a time. (*) Depend on the web browser (check browser compatibility). Units: km, miles or nautic miles for distance. Meters or feet for elevation. km/h, mph ou knots for speed. To open tracks, you can drag and drop files into the web page. Here, this is Windows. But it also works on Linux and Mac. Select a track to get more details on a given points of the trail. A map for French users but you can see that all windows can be moved, resized, docked. The graph: several kinds of data can be displayed in. Use the +/- buttons or the mouse wheel to zoom in/out. 2 maps are displayed. The maps are automatically centered on the cursor when it moves. Tip: The StreetView pegman sometimes offers nice panoramas closed to our tracks. Useful for remembering a good ride or checking the route of a new one. Web browsers that do not support reading of local files need to use the server. The loading is then much slower but, once the tracks are loaded, MyGPSFiles normally works. GPS signal losts appear in grey in the slider bar. The corresponding segments are not drawn to the maps/graphs. Those segments are still used in the distance computation to be as close as possible to what you rode. All rows of the table are sortable. Sums of distances, durations, elevations are displayed in the bottom of the table. Another feature of MyGPSFiles: tracks modification and creation. Like other good editors, it is possible to add and move points, change starting and end points, revert the track. 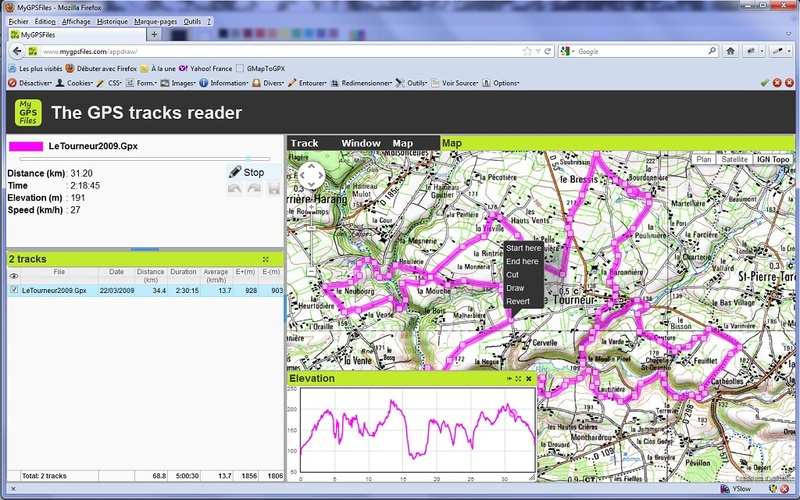 Route calculation: the pedestrian version is really good for trails. Track following: load tracks, then you can request the track being edited to follow parts of them. 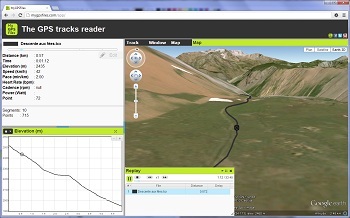 Elevation data is retrieved from MapQuest servers. Load all tracks and take advantage of the path following tool to create your own new track with very few clicks. Quickly modify a track. 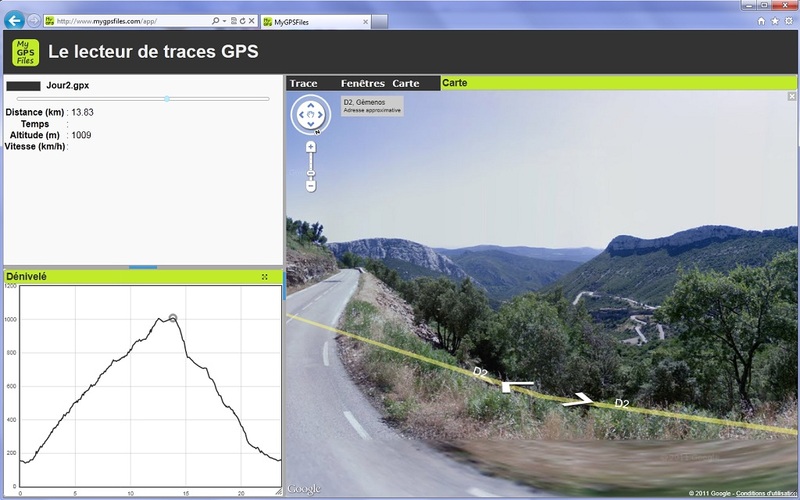 According to the map scale, MyGPSFiles offers a limited number of reference points to move. At small scale, you can accurately modify the track. At large scale, you can modify the track on several hundred of meters (or km) by moving a single point. To save a track, there is a shortcut in Chrome: drag & drop it from the WEB browser to the PC desktop. Check the note 3 below. Note 2: Adding or moving a point leads to the loose of time information: date, duration, mean speed, etc are removed. The red course has been drawn with 5 clicks (no more). It reuses the elevation of the followed track. The reference points. Their number depends on the map scale. Right click on it to open a dialog with the available tools. As a complement to the editor, the Toolbox is a set of tools to prepare your tracks. It is available from menu Window > Toolbox. The tools actions range is quite large. You will get help in the app when you select one tool. The Replay window allows to replay tracks. 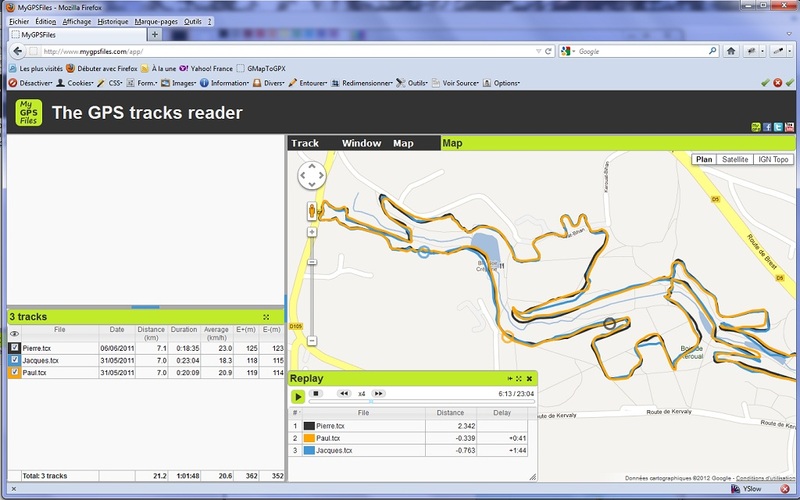 If you load several tracks done on the same course, you can use this feature to do a virtual race and thus compare your performances. Note 1: Replay is relative, at t=0, all cursors are set at the beginning of each track. Then, they move from this point. So, starting points are really important. Use the editor to change them if necessary. Note 2: The ranking is based on the done distance. The 1st one is the one that did the longest distance at the instant t.
Press the space key to launch the replay. Controls are the same as a video player: Play/Pause/Stop. After 5min45, Pierre has done 2.342km. Paul has done 339m less. Paul is 41s late (Pierre was where Paul currently is 41s ago). Embedded mode: the camera stays behind the cursor and follows it as if the camera were at the of a pole attached at its back. The cam position settings can be changed in Preferences -> Map. Traveling mode: the camera moves so that the cursor is displayed always at the same position on the screen. The map does not rotate anymore. It stays oriented to the same direction. 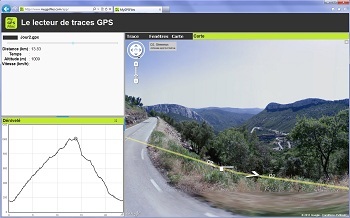 Click on the cursor or move the map to switch the mode..
MyGPSFiles allows you to temporary share tracks. Private: only you know the URL of the generated link. You are free to share it with anybody. Quick to create: No registration is required. In 2 clicks, you can send GPS tracks to your friends. Convenient: The app generates QR codes to download shared tracks from a smartphone. 1/ Load tracks to share within in the app. That's all! You will get a link for sharing and another link to delete the share. Note: Keep the 2 generated links. There is no way to retrieve them afterward. As for the whole application, there is no warranty on the data storage and on the confidentiality of the shared data. But there should be have no problems. I trust web server host for data storage. And ids of shares based on 8 characters are very complex: it is almost impossible to find one by chance. 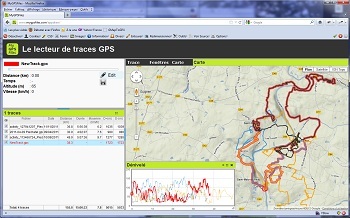 If you want to share and display GPS tracks in a permanent way, it is possible by using a file hosting website. Well, for the moment, only Dropbox is supported. To see these tracks onMyGPSFiles, take the address of the application "https://www.mygpsfiles.com/app/", add it a hash "#" and then the link to the Dropbox folder. The application loads all tracks whose format is supported and ignores all other files. If a file called mygpsfiles.txt is present, the app will read it in order to retrieve information sharing: title, author and description. The format is simple. I hope this example will be enough to understand it: mygpsfiles.txt . After 8 months, the MyGPSFiles plugin is no more required to display your tracks. The new web application does not need it. The old web page used by the pluhin (/onmypc/) will be still available but no more maintained. I advise you to uninstall the plugin and to use the new app. In terms of functionnalities, you loose the file explorer and the shortcut to launch MyGPSFiles when you click on a GPX or a TCX files. 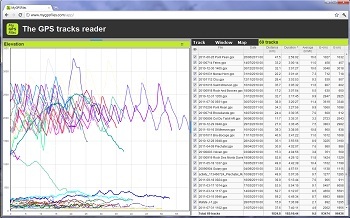 But, you win in quick loading, accuracy (all points of the track are now displayed) and in ease of reading (you choose the tracks you want to display). On my side, development becomes easier. If I add a new feature, I will not have to ask people to install a new version of the plugin. 23/11/2018: Stop using Google Maps. 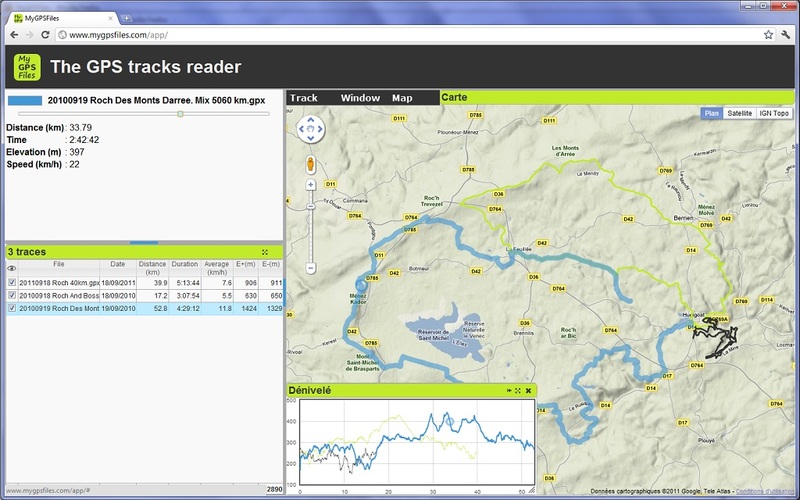 Maps are now rendered by Leaflet and we use maps based on OpenStreetMap and family. 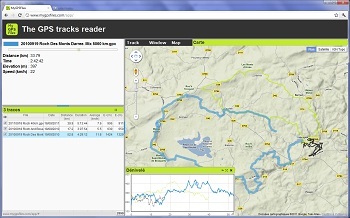 03/04/2014: Added read support of FIT tracks files (Garmin GPS). Read only. 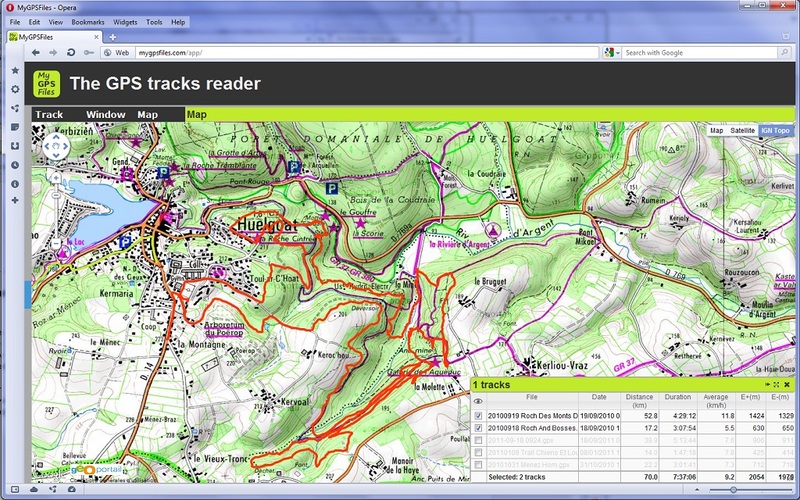 If you modify the track, the file will be stored in another format like GPX. 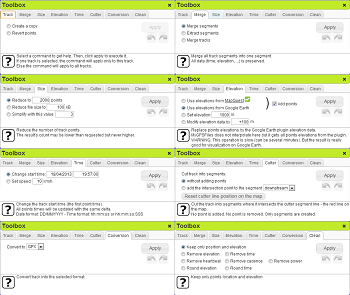 27/02/2014: Toolbox: Added a tool to accelerate or slow down the time in tracks. 16/07/2013: Added a map scale on the main map. 20/06/2013: Made the app run better on Internet Explorer 10. Updated the "Web browser compatibility" section of this page. 06/05/2013: Added Menu > Track > "Remove not visible" to remove all hidden tracks from the app. 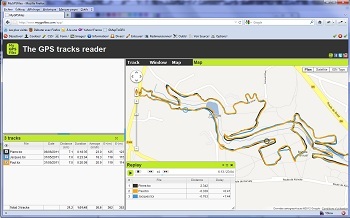 11/02/2013: Added drag & drop of track from the WEB browser to the PC. Work only with Chrome. Be careful: there is a bug in Chrome that may freeze it. Check here. 31/01/2013: Added a map search box. 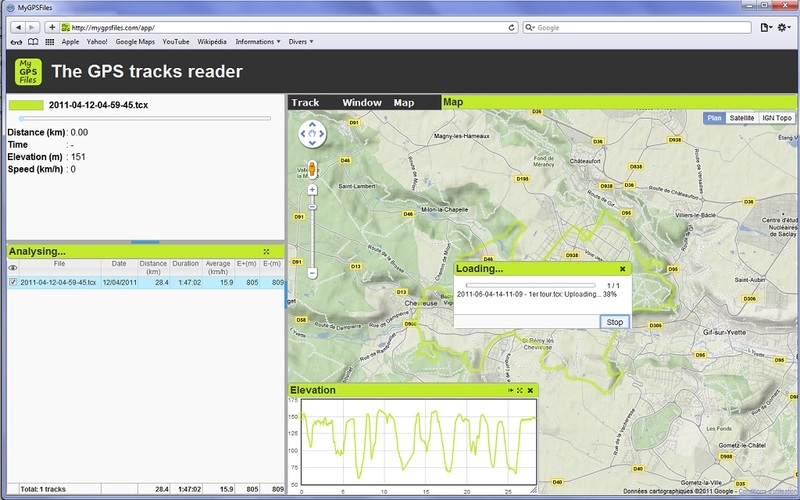 Track edition: Elevation data are now retrieved for new points. Courtesy of MapQuest. 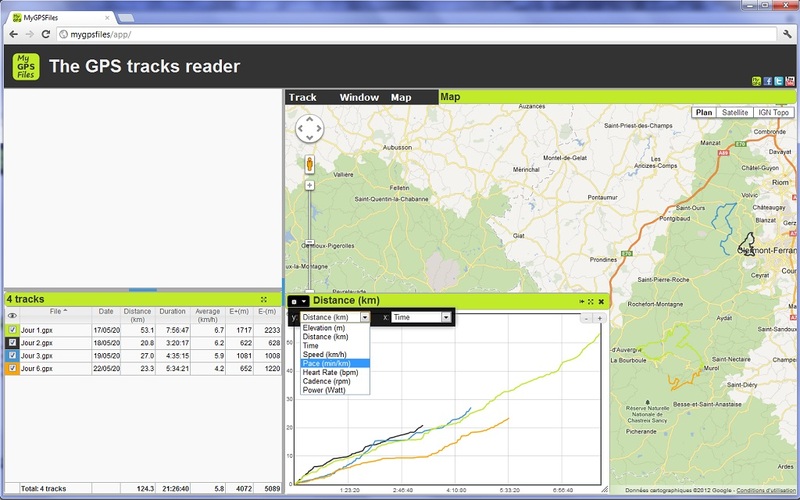 01/01/2013: Track edition: Added route calculation between two points. The route for pedestrian, bicycle or car is provided by Google Maps. 12/12/2012: Since October, I have made a lot of small updates. They included minor bug fixes and small improvements in existing features. 28/10/2012: The position of the map when the app starts can be now set in Preferences -> Map. 10/10/2012: The space key starts / pauses the replay. In 3D, the camera follows the cursor (doc). 10/09/2012: Added 3D terrain exaggeration settings. 09/09/2012: 3D with the Google Earth plugin (doc). You can select the data to display. You can zoom on X axis with the +/- buttons and with the mouse wheel. 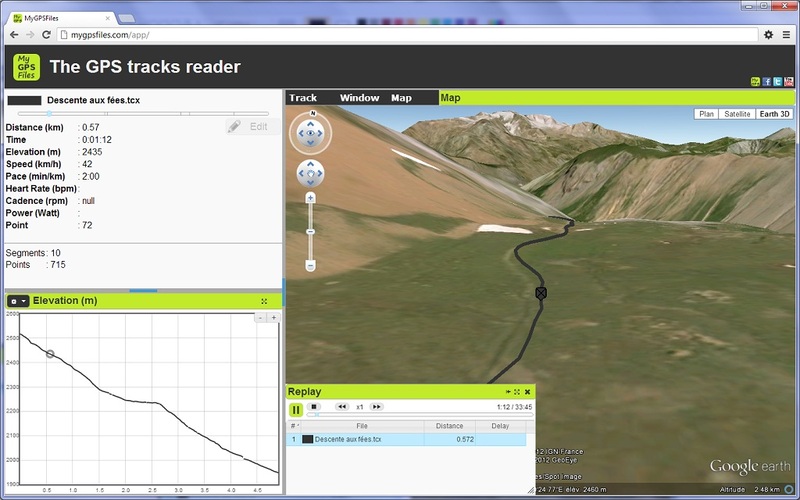 17/04/2012: Fixed a bug in elevation computation. 03/03/2012: Track creation & edition (doc). 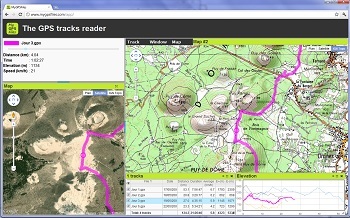 22/01/2012: MyGPSFiles is now on Twitter and Facebook. 17/11/2011: On Internet Explorer, set up the Google Chrome frame plugin to use 100% of the MyGPSFiles features. 08/11/2011: Display GPS signal lost (screenshot). 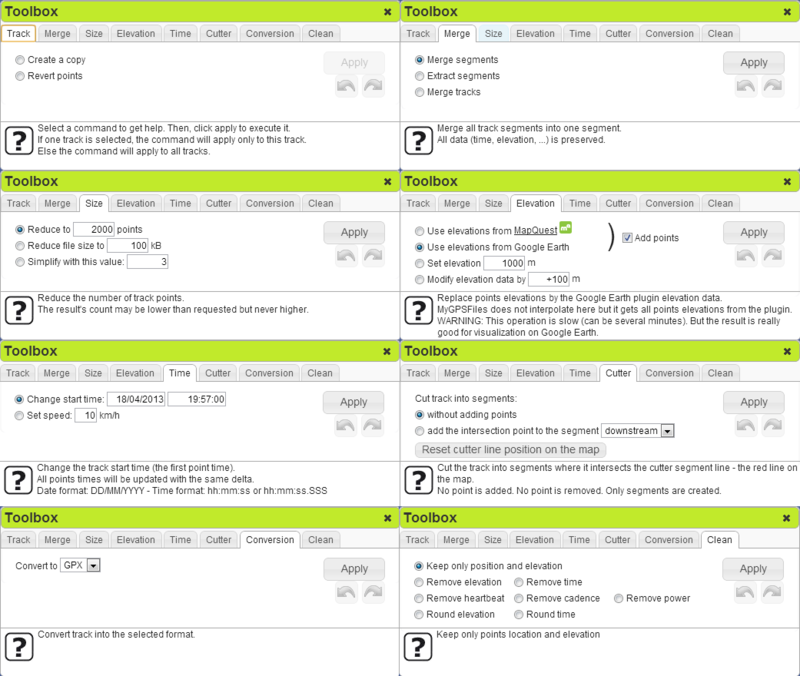 31/10/2011: New application: The plugin is not more required. 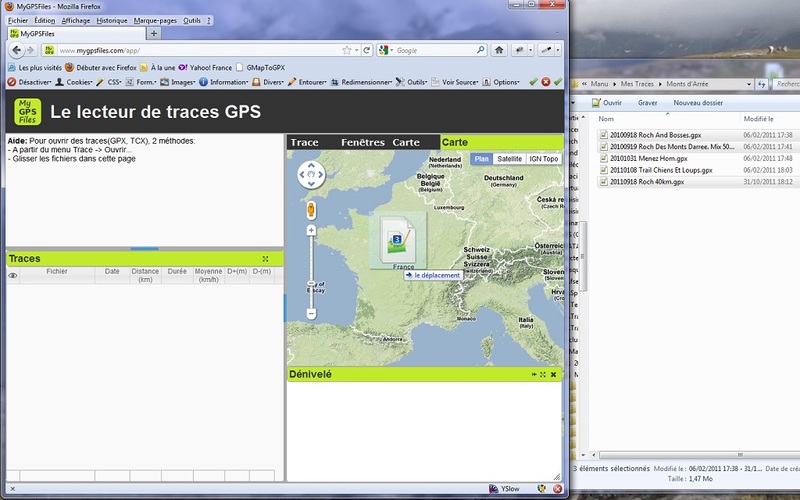 MyGPSFiles runs on Windows, Mac and Linux. 25/06/2011: Tracks colors can be changed. 14/06/2011: Opera is supported again. Well, the application indicates what to do if it fails to start. The application is now compatible with Internet Explorer 9. Added a preference dialog to change the language (English or French), the units, the width and the opacity of tracks. 15/04/2011: The tracks of the current folder can be hidden/displayed. The sums are updated according to the selected visible tracks. Display sums of currently displayed tracks: sums of distances, durations, elevations and the mean of speed means. Added a second map view. Available from menu Window > Map #2. By default, maps follow cursor moves. This options can be disabled (Map > Follow cursor). 06/02/2011: Launch of the website. This project uses numerous tools and libraries either from the open source community or made freely available. The quality of these projects is really impressive. Leaflet for maps rendering engine. Géoportail for French topographic map. jquery for all graphics (windows, tables, graphes, ...). I use the following plugins: layout, mbMenu, jstree, ui, jqGrid, flot, Mousewheel, populate, localize, jquery-cookie, jquery-file-plugin, jQuery-File-Upload, jquery.iframe-transport. Downloadify & swfobject to save file. OpenLayers for the XML decoding. YUI Compressor by Yahoo to boost up the application loading. MapQuest for the elevation data. ANT+ / thisisant.com for the FIT documentation. This is a "midnight" project. Its progession depends on my spare time and the weather. The story of this project is quite classic. 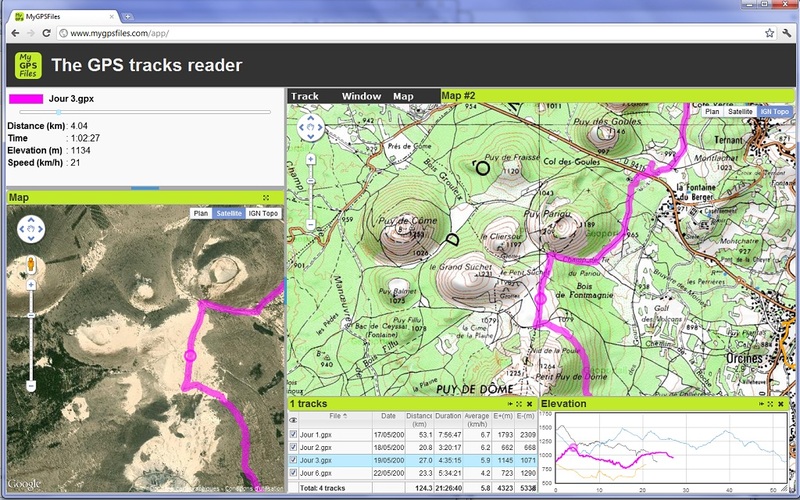 I have been using for years an homemade application to display my gpx files without having to do plenty of tricks, upload, etc. 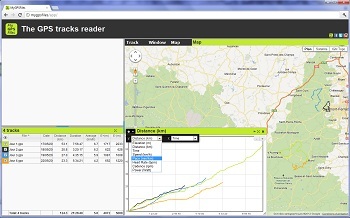 This winter, as I still did not find a simple tool to read my tracks, I decided to make my homemade application more user friendly in order to share it. And here is MyGPSFiles.